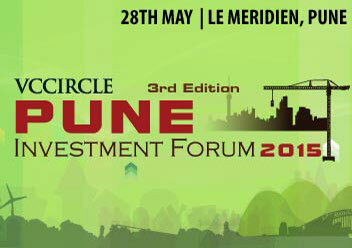 VCCircle Pune Investment Forum 2015 will focus on the thriving investment ecosystem of Pune and is expected to enable business leaders, startup founders, CEOs and aspiring entrepreneurs from diverse sectors such as automobile, manufacturing, pharma, real estate, health care, education besides technology & IOT to learn, facilitate dialog and connect with investors. Panel I: Pune’s entrepreneurial ecosystem & emerging trends: What does the proximity to financial capital mean for Pune’s entrepreneurial ecosystem? Pune, popularly titled as a hub for manufacturing & engineering industry, is also becoming a natural choice for other fast growing industries across technology, IT, education, healthcare, real-estate sectors to launch their centres. What makes Pune a preferred business destination among the new breed of start-ups? What does the proximity to financial capital mean for Pune’s entrepreneurial ecosystem? What are the other crucial elements favouring entrepreneurial growth in Pune? Is it the availability of skilled work force, relatively lower cost of ownership/rentals for offices, emerging investment ecosystem, climate or culture? Are start-ups based out of Pune able to grow, gain strengths and attract fresh investments? Mahesh Deshmukh - CMD, Chetas Control Systems Pvt. Ltd.
Mritunjay Singh - Executive Director & COO, Persistent Systems Ltd.
Panel II: Raising venture capital for emerging businesses in Pune: Which segments are driving investors’ interest? VCs, who have been actively funding entrepreneurs from the cities of Bengaluru, NCR and Mumbai are turning their heads to Pune to screen opportunities. Is it the success stories of companies such as Persistent Systems, Pubmatic, Quick Heal Technologies, Druva and Prabhat Dairy that are prompting VCs to take a closer look at opportunities budding in the city and find the next star entrepreneur. Is the Pune entrepreneurial ecosystem keeping up with its pace of growth? What are VCs’ philosophy when it comes to funding entrepreneurs from Pune? Which are the sectors VCs are looking at? How are entrepreneurs in the city raising venture capital? Sumit Tayal - Director, Helix Investments Advisors India Pvt. Ltd.
With an existing pool of skilled techies and availability of talent, entrepreneurs in Pune are banking on emerging technologies to drive innovations. What are the latest innovations and technology products coming from Pune? How big is the IoT & emerging technologies opportunity for Pune-based entrepreneurs who are developing data & technology driven applications? Sagar Apte - CEO and Founder, CarIQ Technologies Pvt. Ltd.
Vinay Nathan - Co-Founder, CEO, Altizon Systems Pvt. Ltd. Taking a note from technology led success stories emerging from Pune, sectors such as healthcare & education have seen a lot of technology led plays coming in to transform these crucial consumer services. What are the recent technology plays that are transforming these consumer facing sectors? How are cloud-based services redefining learning experiences? How impressive are tech processes in improving patient care & delivering real time information? What are the opportunities for startups in this space? What is investors’ perspective on healthcare and edu-tech start-ups in Pune? Pune’s real estate market stands resilient as we see the entrepreneurial ecosystem picking up in the city besides the native sectors posting moderate growth. While real estate activity is seen in commercial as well as residential segments, we try to understand which sectors are driving demand in real-estate industry in Pune. Which sub – segments— residential, commercial, SEZs, IT parks, modern format stores, retail categories—are becoming the driving force for real estate industry in Pune? Will Pune witness healthy real estate absorption in 2015 - 2016? Have PE investments penetrated enough into Pune's real estate industry or is there more room left? What are the complexities attached in achieving expected targets and RoI? Panel III: Mapping angel activity in Pune - What opportunities are angels betting on? As data suggest, there are 300+ potential start-ups trying their luck in Pune and the number is growing. With a series of successful companies emerging and a lot of successful entrepreneurs and corporate leaders venturing into angel investing, ‘angel’ is a no more an alien word for aspiring entrepreneurs in Pune. How good is the Pune’s ecosystem when it comes to angels, start-ups mentors, accelerators and incubators? Can we expect a lot more action in the start-up funding scene in Pune? If yes, what role will angels play in lifting up such emerging start-ups? What are the Pune-led opportunities, angels are betting on? Here representatives of disruptive companies from Pune will make presentations on their business, differentiation, traction, product market opportunity and how they will disrupt existing ecosystem to the houseful of investors & fellow entrepreneurs.